Michael White at Ocean Independence calls to confirm that the price of his joint central agency with Peter Thompson, the 42.8m motor yacht Lady Goodgirl, has had a $900,000 cut in price. Lady Goodgirl was built in 1964 by Hall Russell to a design by Phillip L. Rhodes and refitted in 1999 and 2004 and 'rigorously maintained'. A classic, canoe-stern superyacht, she accommodates 11 guests in a master, VIP, double and two twin cabins plus a Pullman berth. 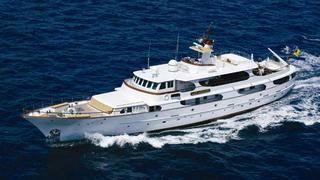 With a range of 2,600 nautical miles at her cruising speed of 10 knots, Lady Goodgirl is now asking $6.95 million.